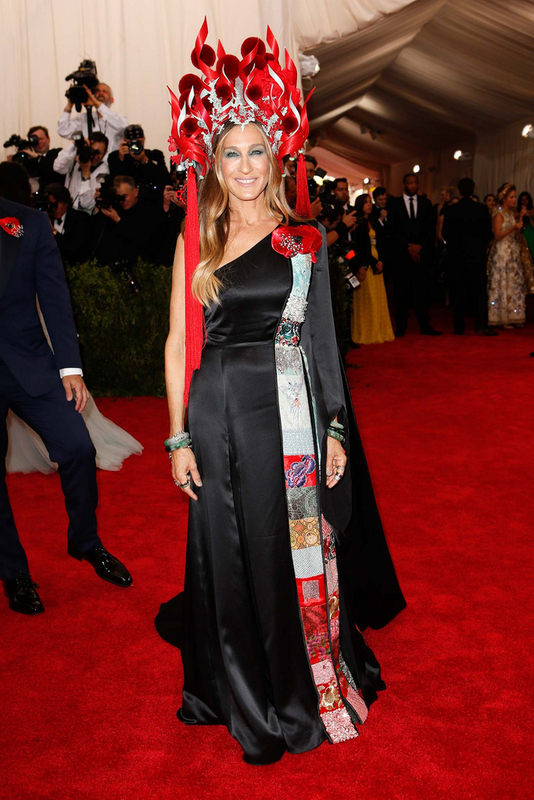 “China: Through The Looking Glass”, the theme for 2015 MET Gala successfully created confusion for some of the designers. Many has mistaken Japanese influences as the same as Chinese. A. Though Japanese and Chinese culture shares many similarities, they are not the same. Ms. Georgia May Jagger’s Gucci dress is more Japanese than Chinese. Dragon and phoenix are important in both culture, so the interpretation is what sets them apart. The green border, the floral embroidery and black belt are leaning towards the Japanese fashion. B. Chloe Savigny’s J.W. Anderson 2-piece ensemble is a better example of Chinese embroidery. It is clever to do modern look and ditched the original Mandarin collar story. The skirt has traditional motives and the colour used is proper, but the neck choker and earring should leave. C. Many made fun of the golden gown, but Guo Pei has got it right and it works on Rihanna. This is a significant robe, traditionally the empress would put on for official functions. It screams POWER. Though I think it would be better without the fur lining. 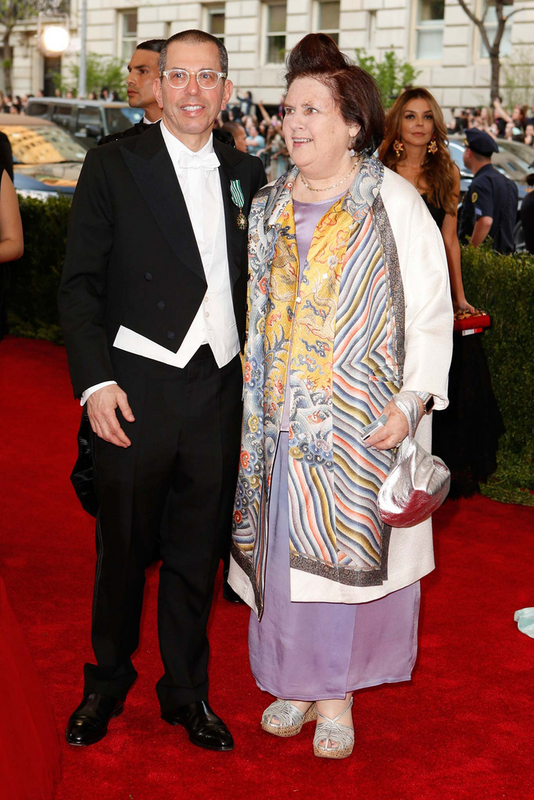 D. Suzy Menkes – Big sister got it right. Her Dries Van Noten coat is subtle, yet a clear tribute to Chinese traditional myths and stories. But the wedge has to be replaced too. E. I do like Justin Bieber in his Balmain. The shirt collar is right, though the waist piece is leaning towards a Japanese wrap, but it works. Surprisingly that he could carry the ‘qi’ of those golden dragons. F. Chen Man – She is the famous China photographer and has photographed some of the most highly regarded people in the country. This lengthy sam-fu is a popular daily wear in the early 1900s, and is famously made known to the world as the Ip Man’s suit – where you flip away the front cover and ready for battle. It is really sleek on a girl too. G. Jessica Hart in Valentino – Simple but right on the dot with the right amount motives. It is rich in colour and work – OK it resembles the pillars in our temples. H. The Chinese beauties – What a disappointment. No one dressed to the theme even though it seems to be the best chance to show the world what’s real and set the record straight. Besides Fan Bingbing, everyone donned on modern dresses, which to me is a real waste of time. China exports such as Sun Fei Fei, Liu Wen, Ni Ni and Tang Wei were all in boring dresses. Not that they looked bad, but just ordinary. 1. Lady gaga in Balenciaga – Some said this is Japanese, but I think this ensemble has a similar story with Rihanna’s gold robe – a status of an Empress. Alexander Wang cut it low at the front and added on feather. Her hair do is a plus point. 2. SJP in HM – This Philip Treacy headpiece single-handedly placed her at the top spots, because it is not easy to get it right, plus its fun. This is a performance headgear and usually appeared in stage shows. The dress has a tapestry lining on one side – clever, because too much of it will kill the look. Wannabe jade bangles and those fashion accessories are marvellous! Sarah Jessica Parker in HM. 3. Anne Hathaway in Ralph Lauren – I know it looks more like Little Red Riding Hood, but this one says ROYAL and CLASS. A single gold tone from head-to-toe, with the hood it looks like a night outing overall for a Princess. That works in a very subtle way! Surprisingly only 2 Chinese natives made it into Top 10. Carolina Herrara knows how to make modern and long-lasting impression. Pure and immaculate in every point. Those tiny red petals that adorned the mandarin collar is a clever move. Traditional top and a blown-up skirt with swirl motives. Pale, but it suits Zhang’s oriental features. She is going for the sweet dolly look. 5. 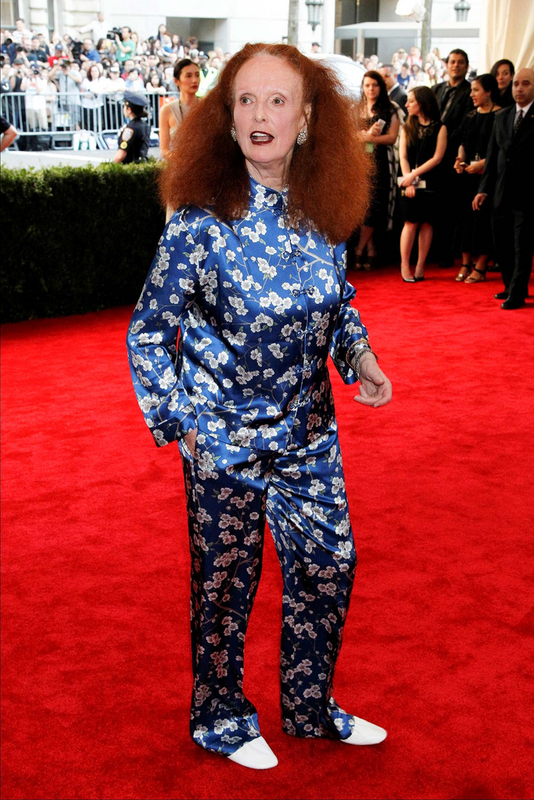 Grace Coddington in Michael Kors – It takes guts and true sense to donned the right outfit to MET Gala, and Grace Coddington is my idol. The traditional sam-fu, is not exactly PJs in English, it is a simple suit for the Chinese men and women back in the 1900s. I like the finishing – with a pair of white flat, which is similar to what people wore back then. 6. Emily Blunt in Prada – A good cape is all you need to look MAJESTIC, even in the navy tone it calls for attention. Coupled with the softest blue gown and a thick waistband, this is a sure win. But a smaller clutch would be better. 7. Dame Helen Mirren in Dolce & Gabbana – Elegant at every turn in her red dress. The multiple Chinese motives laser-cut reveals the right amount of flesh, and her red bra. Why trying to defy gravity when you can embrace it? The wisdom is hard to come by. OK though this is not very Chinese inspired, but I do like it. Oh and that little red-white lace clutch – brownie point! 8. Gong Li in Roberto Cavalli – The ultimate Goddess in a QiPao. As one of the most significant dressing style for the Chinese women, QiPao is constantly evoking new ideas in the fashion world. This is the bloody version, with exquisite work at the back – see-through lace that has Chinese fans and flowers on it. The rich crimson red on velvet is definitely larger than life, and it takes a real woman to pull it off. Love the earring too. 9. Bee Shaffer in Alexander McQueen – Young maiden in full-blown plum flowers and a phoenix tail. 10. Janelle Monåe in H&M – Cute and totally her age. The modern braid sealed the deal. The long cape and mandarin collar are beautiful, but what’s fun is the midriff bearing and over-the-knee skirt. Impressive.